LABOUR leader Jeremy Corbyn took centre stage at the TUC annual conference in Brighton on Tuesday to make his first speech there as Labour leader — and was welcomed “as a breath of fresh air” by the hundreds of trade union delegates present. He made a broad-ranging speech covering many topics but uppermost in his thoughts — and those of the delegates — was the Tory Government’s Trade Union Bill. And he promised that if elected to government in 2020, Labour would repeal this Bill and replace it with a workers’ rights agenda. TENS OF thousands of people last Saturday marched through central London to call on the Government to do more to help refugees. It coincided with similar marches in other European capitals on the same day. The event was supported by the Refugee Council, Amnesty International, the Syria Solidarity Movement, Stand Up to Racism and the Stop the War Coalition. Marchers called on the Government to accept a lot more refugees into Britain than the 20,000 he has pledged to accept — over the next five years. Most western European countries are accepting far more than this and many feel ashamed that Britain is not taking its share of the influx — especially when British foreign policy is one of the main causes of the refugee crisis. Marchers were also demanding an end to British and Nato interference, invasions, bombings and drone strikes against those countries in the Middle East and north Africa where most of the refugees are coming from — fleeing because the attacks have made their homes unsafe to live in. 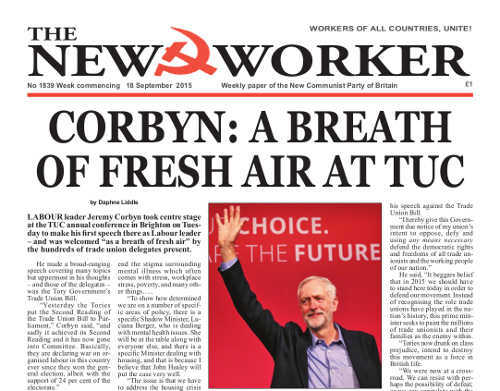 JUST a few months ago people were telling us that the Labour Party was a part of the capitalist state machinery and its right-wing leadership so firmly entrenched it could never be reclaimed by the left-wing of the party — which was now a dwindling band of MPs who would soon be gone — and the best thing the working class could do was to quit Labour and try to build another new labour and trade union movement. But The New Communist Party is a Marxist-Leninist Party and we knew that the structure of this party, created by the trade unions, was tied to the working class and that, in the right circumstances, it could once again become an instrument of the working class in the struggle against capitalist exploitation, warmongering and greed. Even so, we were as surprised as most people that the change in the nature of that party’s leadership happened so quickly. Dialectical processes are like that, a long slow build-up of pressure that can go unnoticed until a tipping point is reached. That build-up of a steady fall in the values of wages, fall in living standards, the withdrawal of state welfare safety nets and the increase in state oppression had been happening for decades. Activists could see it in the growing street protests against austerity — that were always under-reported if reported at all by the media. But there was no indication of just how big the swelling class anger was growing. The right-wing Labour leadership ignored it while the media treated all protest as the impotent actions of a tiny lunatic fringe outside of normal society.